Born and raised in Jackson, Mississippi, Mike’s deep-south influences provide the foundation for a musical style that encompasses popular, blues, boogie-woogie, and jazz genres as well as original works. His Southern easy-going charm, sparkling arrangements, and superb musicianship are hallmarks of his performances. As a composer, Mike has always been inspired and driven by melody. He also loves to experiment with motion and texture, using the piano as his own orchestra. He has developed his own unique style of piano artistry and has racked up some impressive achievements. In addition to his original music airing for 7 seasons on CBS Sports PGA Golf, his music has also been heard on the NBC, FOX, CBS and ABC television networks as well as several major motion pictures. In 2009, Mike’s positive message song/animation “Spread Joy” was featured on ABC Good Morning America. He has established himself as a prolific recording artist, releasing 22 CDs to date on his own label, MSP Records. His CDs have sold over 350,000 copies and are distributed in the USA and digitally throughout the world. 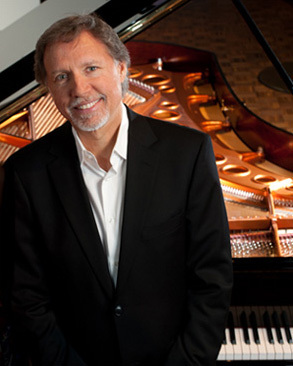 He has published many of his unique solo piano arrangements of popular and original music with more to come. His YouTube channel features many of these arrangements which are popular with advanced pianists all around the world. This one-of-a-kind pianist performs as a solo piano artist, and with his duo or trio. As a seasoned arranger and composer, Mike performs as a guest soloist with orchestra bringing his custom orchestrations of popular and original music to the concert stage. Mentorship is a very important part of Mike’s musical life. Often, when he performs in a community, he mentors the local talent, whether vocalists or instrumentalists, and includes them as guest performers in his concerts. To find out more about his outreach/mentorship program, click here. Living mostly in Oregon but with frequent visits to Mississippi, Mike continues to perform, teach, arrange, produce and record.